Posted: Tuesday, May 22, 2018. 2:12 pm CST. 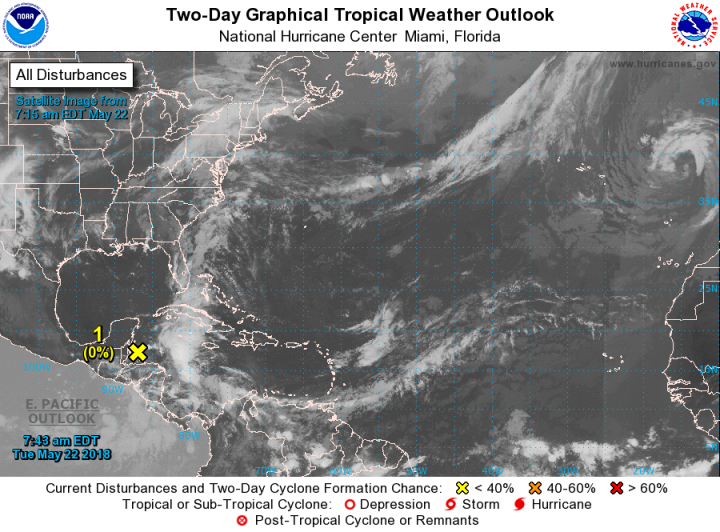 By BBN Staff: The National Hurricane Center has issued an update on the disturbance located just east of Belize. The broad surface low is producing a large area of cloudiness and showers extending from the northwestern Caribbean sea across Cuba into the Florida peninsula. Strong upper-level winds and dry air aloft are expected to limit organization during the next couple of days. Gradual subtropical or tropical development is possible late this week while the system moves slowly northward into the central or eastern Gulf of Mexico. The chances of tropical development are near 0% through the next 48 hours and 40% through the next 5 days. The system should be monitored closely by all interests along the Gulf coast due to the uncertainty of the path of the system. BBN will bring you online developments as they become available.